Project the scrambled list of designer first names and last names onto the SMARTBOARD and have students try to match to create actual fashion designers. Go over the answers to see how many they put together correctly. Next, have them write down who they believe to be the top ten legendary fashion designers. Share lists and write on the board. View the YouTube clip sharing the Top Ten Most Famous Fashion Designers and have students place a star beside those that made the list. 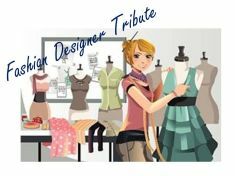 Assign the Fashion Designer Tribute project and either randomly assign or allow students to select and sign up for a fashion designer to learn more about. Either way, only one designer per person is allowed. More extensive lists of designers can be found here and here. Students will use their iPads or laptops to research background information pertaining to their fashion designer and complete the template provided. Students will print and cut a picture of the designer and three major fashion designs of their line. The rest can be neatly and creatively filled out with markers. Students will then create 3 totally new, original pieces (clothing, footwear or accessories) inspired by this designer and explain how they incorporated the designers “signature” into their pieces. These will be sketched with colored pencils on the templates provided below. Sketches can be created vertically or horizontally with explanations written on the back of each new design. Finally, students will share their designer and new creations with the class. If you want students to take notes on the designers, then the sketches can be used as a review activity (instead of shared during presentation) titled “Name that Designer” where students have to identify the designer by the notes they took from the presentations. In the end, any part of this project can be used as a bulletin board display for all to see and learn about fashion designers throughout time. Wow! excellent work.. keep it up… thanks.